I’ve recently returned from my first ever trip to the Canary Island of Tenerife, and although I wasn’t sure what to expect, the island is full of things to do. As a couple in our twenties we were looking for something fun and exciting to do, and after a quick bit of research, a trip to both Siam Park and Loro Parque were on the itinerary! We stayed in the quiet Gold del Sur Resort on the south side of the island, and we had a hire car so the journey to Siam Park was very short and simple. 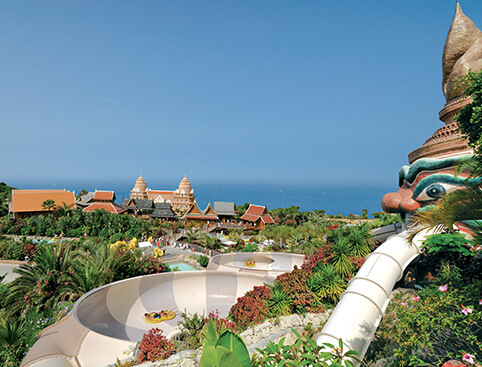 Siam Park is known as the biggest water park in Europe, and we were certainly not disappointed! The park is beautifully presented; it’s like walking into a whole new world. As soon as you arrive, you are greeted by the sea lions relaxing in their pool, and then you can stroll through the ‘floating market’ over ponds full of huge koi carp fish. The park has a Thai theme throughout, with plenty of lush greenery and snaking pathways leading you to the different attractions. We were really impressed with the variety of rides at the park, with the perfect mix of family, relaxing, and adrenaline. Unfortunately the Wave Palace was closed for maintenance on our visit, but there was plenty more to keep us busy. We started off with a peaceful drift along the lazy Mai Thai River, which allows you to see the majority of the park from your inflatable ring, including floating through the shark aquarium tunnel! I’m not typically a thrill seeker, but I did manage to stomach all of the rides (even the ‘difficult’ rated ones!) except for the might Tower of Power, which is a frightening 28m free-fall drop slide. The rides were absolutely fantastic and quite unique, as they weren’t your typical shooting-down-slides. For example, The Dragon was a cone-shaped ride which had you spinning round, and The Volcano was in the darkness. The rides were great for people of all ages, and the queues were very well managed by the friendly staff, who did their best to ensure visitors got on the rides as quickly as possible. We spent a whole day at the park, and stayed for lunch which was excellent value for money (a drink and a baguette for only 5 euros). I’d love to visit Siam Park again! Our next day trip was to the sister attraction Loro Parque, which is on the north side of the island, but easy to find along to motorway from the south. The zoo isn’t huge but is very well set out and is again very green and well looked after. The main appeal for me to visit was to see their Orca Ocean performance, with a group of killer whales from SeaWorld. The show was spectacular, and the huge animals were very well trained and provided lots of entertainment. Their massive tails create quite a splash! Loro Parque also has a dolphin stadium where the beautiful dolphins provided a graceful and perfect performance alongside their trainers. This was thoroughly enjoyed by spectators of all ages, and the dolphins had some very impressive acts. There are two other perfectly executed shows at the park, the sea lions, and the Loro Show with the exotic birds and colourful parrots. The sea lion show is guaranteed to make you laugh, and each sea lion has their own delightful and unique personality. There is also Planet Penguin which enables you to see into a penguin habitat full of hundreds of penguins, real snow, and a huge iceberg. 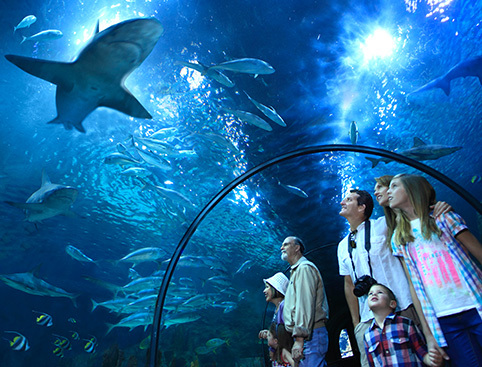 Other animals at the attraction include chimpanzees, gorillas, jaguars, tigers, alligators, flamingos and various sharks. The zoo provides a full day of discovery and entertainment, although the food is a little on the pricey side. But overall the park was well worth a visit and was good value. We received a free €10 food voucher when we booked the Siam Park & Loro Parque twin ticket through AttractionTix. Great review, Victoria! During my stay in Tenerife, I was able to visit Loro Parque (in the rain!) but I never got the chance to visit its sister Siam Park – but it sounds like you had an awesome time. I really cannot wait to go back! Thank you for sharing your review, you’ve certainly pushed Siam Park to the top of my wish list!